1. Know where your lungs and windpipe are. 2. 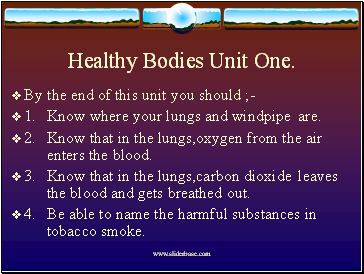 Know that in the lungs,oxygen from the air enters the blood. 3. Know that in the lungs,carbon dioxide leaves the blood and gets breathed out. 4. Be able to name the harmful substances in tobacco smoke. 5. 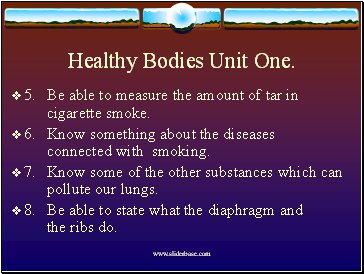 Be able to measure the amount of tar in cigarette smoke. 6. Know something about the diseases connected with smoking. 7. Know some of the other substances which can pollute our lungs. 8. Be able to state what the diaphragm and the ribs do. 1. 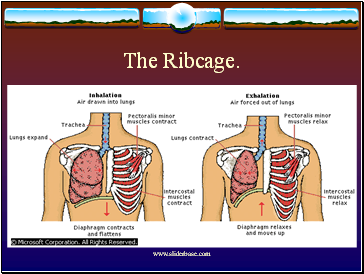 The lungs are protected by the ribcage. 2. 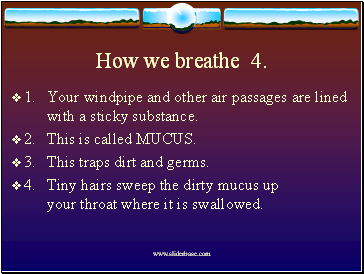 Air enters our lungs via the trachea or wind pipe. 3. When the air enters our lungs,the muscle called the diaphragm goes downwards. 4. 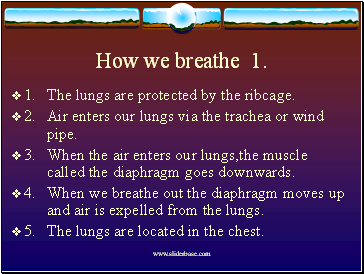 When we breathe out the diaphragm moves up and air is expelled from the lungs. 5. 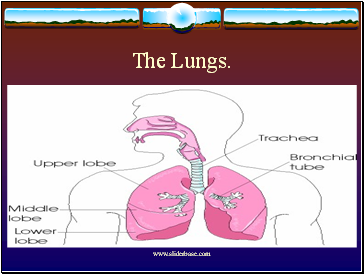 The lungs are located in the chest. 6. 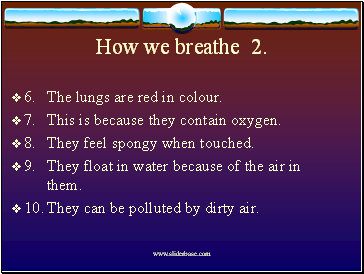 The lungs are red in colour. 7. This is because they contain oxygen. 8. They feel spongy when touched. 9. They float in water because of the air in them. 10. They can be polluted by dirty air. 11. 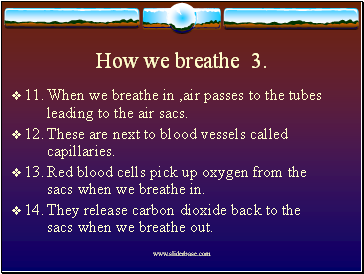 When we breathe in ,air passes to the tubes leading to the air sacs. 12. These are next to blood vessels called capillaries. 13. Red blood cells pick up oxygen from the sacs when we breathe in. 14. They release carbon dioxide back to the sacs when we breathe out. 1. Your windpipe and other air passages are lined with a sticky substance. 2. This is called MUCUS. 3. This traps dirt and germs. 4. Tiny hairs sweep the dirty mucus up your throat where it is swallowed. 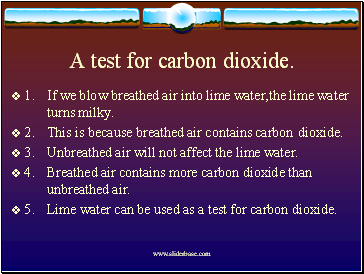 A test for carbon dioxide. 1. If we blow breathed air into lime water,the lime water turns milky. 2. This is because breathed air contains carbon dioxide. 3. Unbreathed air will not affect the lime water. 4. Breathed air contains more carbon dioxide than unbreathed air. Effects of air pollution on the body.